As part of the closing events for the year long initiative Isle of Architecture, a special concert reflected a diverse use of a very special building in Peel. Isle of Architecture is a celebration of the built environment, encouraging appreciation of the Island’s rich, architectural heritage, as well as exploring the future of building on the Isle of Man itself. 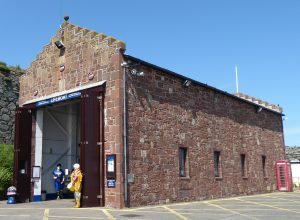 The lifeboat station, which houses the vessel Ruby Clery (currently celebrating twenty five years service), is situated by the breakwater in readiness for any sea-faring problems, but on this occasion was being used as an unusual concert venue for three local groups. Built in 1885 at a cost of £500, the concept encouraged music lovers to fill the building to capacity to hear up and coming Scran, new group Clash Vooar and the popular Mollag Band. Scran is relatively new on the music scene, consisting of some of the more experienced members of the Manx youth group movement Bree. Aged fourteen to eighteen, their music introduces a modern, dynamic twist, with vocals in both Manx and English. Clash Vooar (Big Groove) is also a relatively recent addition, developing Manx music and Gaelic song using the distinct medium of a gypsy, jazz groove. The evening closed with the ever popular Mollag Band, who diversified their programme with a selection of songs from their Manx-Anglo Pop Project and a number of favourites from their back catalogue. All proceeds from the evening were donated to the RNLI. ‹ 2018 Convention! Have you booked yet? Come on, it’ll be great, eh!